LUXI compounds are designed to stay active on buffs for longer, working at lower temperatures than traditional compounds, allowing a operators to reduce the number of processes to an absolute minimum. In many cases only one process is requried for scratch removal and final lustre. Compounds are very clean to use and non harmful to operators. Luxi will reduce overall polishing costs, and improve the final quality result. Luxi is the comprehensive polishing solution for all polishing of precious and non precious metals. • Reduce Metal Loss: Metal loss is very less using Luxi, as it smoothes out scratches with metal from the piece being polished. Metal loss car be reduced by as much as 25%. Using sandpapers before using a compound can be reduced when Luxi is used. This will reduce the metal loss associated with sandpaper use. • 100% Vegetarian: Made from Alumina, Vegetable fat unlike traditional compounds that are made from animal fat, iron oxides and silica. 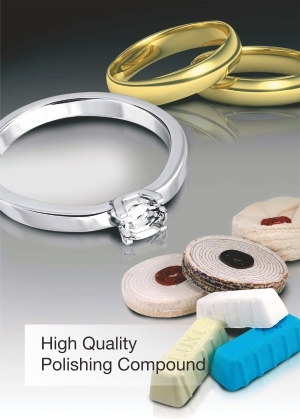 • High Polish: The result is high quality polishing at lower cost and with much less hazardous residue created.